We've been saying all year that the officiating of this great game has been ordinary. We have been worried poor calls would determine a game. 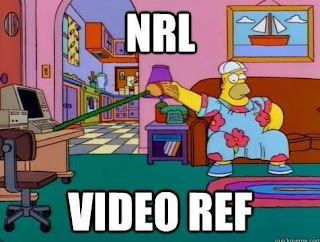 Last night we saw the actuality behind this, with two poor video ref decisions costing the Cowboys any chance of winning the game. We can't change the past but we can move forward with some certainty and a better product. The game lost big time last night. Facebook and Twitter were abuzz last night with most fair-minded supporters calling it as they saw it. The Cowboys were robbed. Manly supporters retorted with the call that led to the Cowboys try, when an Ash Graham hand dislodged the ball being carried by a Manly Player. Again, most fair-minded supporters would call that a bad call, BUT it happened in the run of play, the call made at game pace and in the ruck situation and the Manly player ultimately has responsibility to hold onto the football to play the ball. I can live with these calls, as do most other supporters. The Video Ref decisions are viewed differently. Multiple viewings, slow-motion, frame by frame should in theory make the decision making process better and more accurate. In reality, it is vastly different. And this is where the anger comes from. How can they get it so wrong! My next point. Video replays played at game pace, and decisions made from this speed. And lets limit the views. The game is played at a pace, and the officials need to make decisions at that pace. I believe, supporters can live with that. They can't live with the current situation. They can't live with incompetence. Take those two video ref decisions out of the game, we have a 12all ball game. Take the Ash Graham decision out, its 12-6 and anyones game. HOWEVER, these werent the only poor decisions made last night. Just the howlers that led to points. You can't take every poor decision out of the game, no matter what they change in the game...momentum is usually the big thing. Most supporters can live with poor decisions made in the running of the game....They cannot accept the Video Ref getting it wrong.